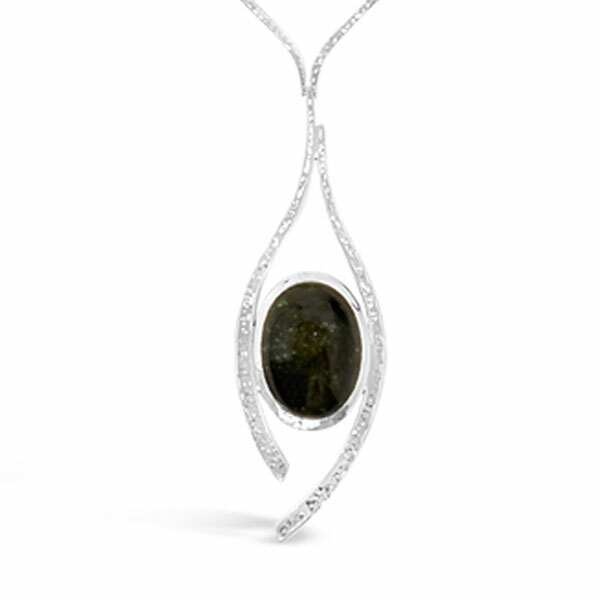 A large tourmaline silver necklace. The green tourmaline 25x20mm cabochon gemstone is a dark green with silvery inclusions giving it a deep lake water look. It is set in between two silver hand forged sections. This can be either hung on a chain as a pendant or as pictured supplied with a hand forged necklace made up of smaller forger curved sections. The hammer marks have been left in making this a truly eye catching and stunning piece of contemporary jewellery.